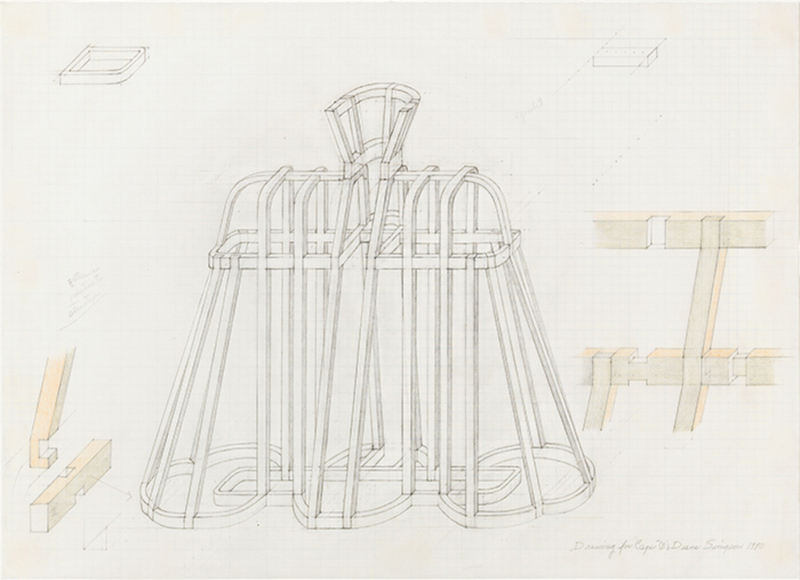 Diane Simpson, Drawing for Cape (B), 1990, graphite and colored pencil on vellum graph paper, 16 × 22". EVERY SCULPTURE by Diane Simpson proceeds from at least one source, though this is a deceptively simple statement: Her singular three-dimensional works tend to come from another dimension entirely, from flat printed matter, renderings of material culture discovered in used bookstores, university libraries, and online archivespictures of medieval clothing, Art Deco patterns, or commercial packaging design. She then fixes on a formally salient aspect of the source, isolating, condensing, and sometimes contorting it in pencil on graph paper. Simpson thereby enacts a private translationan abstraction, a heighteningfrom one two-dimensional surface to another, from print image to hand drawing. These drawings ultimately serve as blueprints for painstakingly made, one-off constructions, their contents transposed into three dimensionsnot as if returning to such a state, but as if for the first time. For it is the worked and reworked drawing, more than the point of origin (a catcher’s chest protector, a seventeenth-century pannier, an Amish bonnet), that obtains within each sculpture. On paper, Simpson not only abstracts from a source but also activates her abstraction as an independent form, determining its particular span, scale, and thickness and any apparatus necessary for its display. For more than thirty-five years, this studied and idiosyncratic approach has led to a body of work fabricated by hand in a range of tough, prosaic materials that are combined and treated with extraordinary fineness. Simpson’s art will be the focus of a major survey opening next month at the Institute of Contemporary Art, Boston. And so the two-dimensional inheres, with purpose and potency, in Simpson’s three-dimensional production. Moreover, in her early sculptures especially, she replicates drawn spaceregistering in real space (or in sculpture’s space) the degree to which spatial information is constrained by a flat plane (or by the space of another medium). The sculptures comprise legible, workaday stuff, and their origins in quotidian sources are, if not quite legible, often appreciable. Yet despite such assurances of familiarity, the spatial reckoning they stage makes these works fundamentally, terrifically strange. Simpson, who was born in 1935, studied painting and printmaking at the School of the Art Institute of Chicago in the 1970s. Just before turning to sculpture, she made numerous works on paper that experiment with axonometric projectionin which a drawn object is rotated axially away from the picture plane and maintains the same scale of measurement along all of its axes. Axonometric drawing is common to ancient Chinese painting, among other representational traditions, and was popularized by engineers and architects in Europe and the United States in the nineteenth century; it was subsequently adopted as a radical aesthetic strategy among the early-twentieth-century avant-garde, as in El Lissitzky’s Suprematist Prouns or Theo van Doesburg’s De Stijl Counter-Compositions. Unlike a drawing in the one-point perspective defined in fifteenth-century Europe, an axonometric rendering does not seem to recede into the distance; rather, it jettisons the optical comforts of dimensional illusion in order to preserve an object’s principal dimensions (proportion, scalar relation) and to transmit this data essentially at a glance. As such, axonometry can look anomalous to untrained eyesdisorienting because it takes the flatness of the drawing surface too literally. By the same token, axonometry is considered expedient precisely because it is literal, unexaggerated, undistorted. Simpson’s axonometry is more intuitive than technical, a personal but diligent system. Since 1978, she has taken the grid of graph paper and a straight ruler as her only guides to establish an angle of rotationtypically forty-five degreesfor each drawn form. Simpson arrived at this system gradually, through collagraph prints, mixed-media collages, and drawings from 1976 to 1978. In these earliest works, she not only rotated but also animated across the picture plane impossibly intricate boxlike shapes that seem to be opening or closing, folding or unfolding, before our eyes (such as Containers, 1976), and similarly intricate forms derived from the vertical enclosures of American Indian cradleboards (such as Cradle Forms, 1978). Simpson began making sculptures in the late ’70s, drafting large graph-paper drawings of further cradle-derived forms, then constructing three-dimensional versions in corrugated cardboard. This inaugural group was first shown at Chicago’s Artemisia Gallery in 1979, sculptures slotted together from flat, cutout componentsbristling, jaunty, and, even when installed, evidently collapsible. Emblematic among them, Corrugated Drawing, 1978, reads like an enlargement of an obscure architectural or mechanical device, some joint or funnel or hook. But it only reads this way when viewed from slightly to the right. Considered from the left, Corrugated Drawing loses its enigmatic shapeliness, appearing instead as if about to fold itself into the wall. Simpson has used this sculpture as a support for drawing: The work’s title accedes to the graphite rubbings that shade the cardboard surface, accentuating the material’s ridges and extending certain edges, planes, and junctures. More important, the title retains a sense of the sculpture’s genealogy, pointing back to the works on paper that prefaced this initial cardboard series. The relief’s peculiar angle of protrusion suggests a single “accurate” viewing position without obviating other, bemusingly skewed vantage points. Thus Corrugated Drawinglike its cardboard peers and many sculptures after itliteralizes the terms of Simpson’s preceding works on paper, realizing in three dimensions the shallow space constituted by the obliquely angled, parallel lineation of axonometry. Literalness is key here, not least regarding the impression given by axonometry that what is recorded literally might not be apprehended literally. Simpson professes that she avoids the literal in her treatment of sources. She does not aim for one-to-one transcription, but rather corrals abstraction as an obvious contra-literal mode and occasionally metaphor as another (when, as we shall see, an article of clothing looks like an architectural feature looks like a piece of furniture, and around again). Yet while her drawings are always axonometric, since the late ’90s not all of her sculptures have remained so. The oblique angles of axonometric drawing continue to afford Simpson a valuable abstractingand imaginativecue, but the sculptures themselves need not rely on axonometry’s actualization for either effect or affect, which emerge instead from other procedures of formal distortion and physical construction. Even when the finished sculptures dismiss the explicitly axonometric terms of their drawn counterparts, Simpson’s works perpetuate the contradiction between matter-of-factness and discomfiture, between the literal and the distorted, which qualifies (our contemporary, Western, nonspecialist reading of) axonometry. The sculptures are feats of hand construction, mesmerizingly precise in their making as well as utterly candid about their madeness. At the same time, they deliver the irresistible sensation that we are experiencing, or straining to experience, something that is not, in fact, physically presenta source, maybe, but also a drawing. Which is to say, we are asked to experience two dimensions within the realm of three. 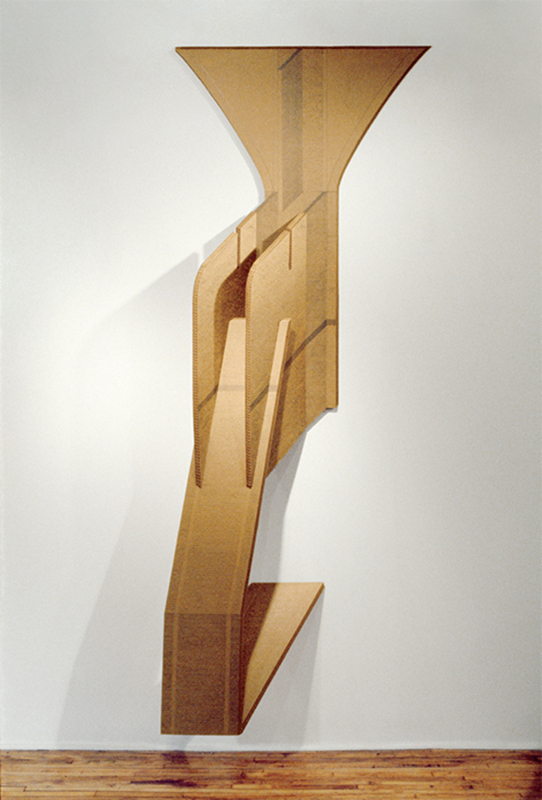 Diane Simpson, Corrugated Drawing, 1978, corrugated board, graphite, 110 × 46 × 18". 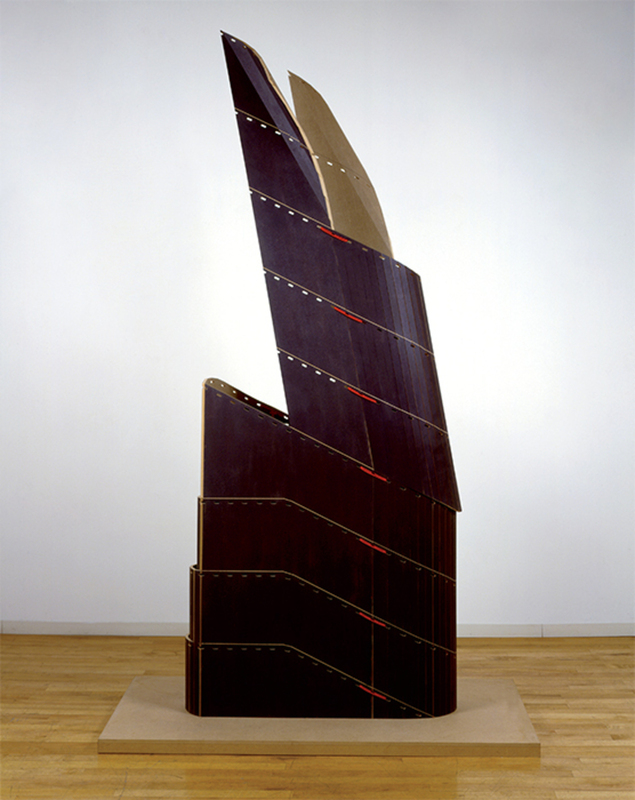 From the series “Corrugated Cardboard,” 1978–80. THE RELATIONSHIP between two and three dimensions is not sussed out solely by that between drawing and sculpture in Simpson’s practice. Her preoccupation with cloth provides another way to approach her engagement with dimensionality. She is best known for her frequent recourse to source material from the history of costumefirst, Ribbed Kimono, 1980; then “Samurai,” 1981–83, a series based on the warriors’ garments; “Historical,” 1984–90, a series inspired by archaic European clothing, such as capes, doublets, and pantaloons; “Sleeves,” 1996–2000; and “Bibs, Vests, Collars, Tunic,” 2006–2008. These are works that launch from fabric sources. Cloth is a two-dimensional material with the distinct capacity to take on, to fall in, or to cover three-dimensional form. This capacity follows from cloth’s relative fluidity, softness, and malleability. However, Simpson’s sculptures cultivate a different set of properties altogether. If the draped figure of Western sculptural tradition could demonstrate an ideal of material virtuousity, hard marble transformed into soft folds, Simpson reverses this move, transposing cloth sources into rigid or tense (and vehemently nontraditional) materials. In the early ’80s, she turned from cardboard to MDF, which she used almost exclusively for a decade. Since the early ’90s, her list of materials has expanded to include Gatorfoam, aluminum, ragboard, metal and vinyl mesh, linoleum, and Lexan; cotton mesh, linen canvas, and nylon and rayon cord appeared now and then before the ’90s as well. At one point, Simpson acquired a large roll of spunbonded polyester (a heavy, opaque, black version of Tyvek) and subsequently plied it for yearsfor instance, in Apron I, 2000, and Collar, 2008. The rigidity and the lightness of cardboard have persevered across the sculptures since, and throughout the early ’80s, the ad hoc quality of the cardboard sculptures prevailed, too, in works fitted together for display, then readily disassembled again. But soon this meant only that Simpson was keen to show how each work was constructed, while the mechanisms of construction grew increasingly meticulous. Court Lady, 1984, is a pivotal sculpture in this regard, the first in Simpson’s “Historical” seriesa group of works prompted by her discovery of a lushly illustrated encyclopedia of costumeand the first to accomplish a three-dimensional curve. To create its curves in otherwise inflexible MDF, Simpson cut the material into hundreds of narrow strips and adhered them contiguously to a linen canvas backing, like a tambour door. Lengths of red nylon cord serve as conspicuous stitching along two long vertical seams, and black plastic fasteners help secure the work’s most extreme curvatures. Court Lady is a pointed examplethe exception that proves a rulefor it is also Simpson’s last sculpture titled after a category of figure rather than of garment. The work stands nearly eight feet tall, its two stacked halves rising to two outspread, collar-like wings. Its lower half tilts upward, tapering to a point, while its upper half simultaneously juts forward and leans back. The effect is one of dignified contrappostoalbeit without a body. Court Lady is emphatically bodiless insofar as it is emphatically hollow. But Simpson’s sculptures are never “about” either the absence or the potential presence of a body. Put more strongly: Hers are not sculptures missing a body or bodies. The sculptures may have clear fronts and backs (the artist is quick to point out that viewers sometimes disagree about which is which), but because they also have clear outsides and insides, we are equally compelled to inspect the back of a front face, the front of a back face, to say nothing of edges, seams, and undersidesor to look through a sculpture entirely. We fixate not on some spectral figure but instead on the full morphology and materiality of each object. None of this is to deny the implications in Simpson’s work of and for figural sculpture. Rather, it is to advance what the sculptures themselves advance, that the divide between abstraction and figuration is overdetermined. Numerous works, such as Cape, 1990, and Pantaloon, 1988, are skeletal (to use an admittedly anthropomorphizing word)openwork MDF structures that demonstrate neither lack nor essence, but rather their own formal intelligence. Cape is legible as its titular object, with a solemn, upturned collar and a footprint that approximates the undulation of fabric. The sculpture is larger than human scale, however; the sides and tops of its struts are stained with orange paint, but not the fronts, which perplexes the figure-ground relationship sculpture might seem automatically to secure. As it happens, the work derives from two distinct sources, two modes of covering or protecting: the sixteenth-century European man’s cape we recognize and a traditional English thatched roof. Tellingly, when Simpson discusses her works, she avoids the phrase “historical costumes,” calling those sources “clothing structures.” The sculptures that result are correspondingly architectonic rather than narrative. She also looks to “furniture, utilitarian objects and vernacular industrial architecture,” she says, and so to possible imbrications of clothing, upholstery, and cladding. The body, where one might grasp at it, is insistently metaphorized as another thing and then another, too. Indeed, if the body perseveres in Simpson’s work at all, it is only as a way to think through how fabric submits to gravitymetaphor inscribing her work in this most particular fashion, when a material such as aluminum or MDF is treated “as if” it could depend like cloth. In Cape, the shoulders from which a garment falls are displaced by the self-sufficient scaffolding of the “cape” itself, and in Shawl, 2013, the sense of shoulders hugged by a garment is even further attenuated: A sheet of aluminum, embossed with a grid pattern, hangs stiffly over a wide-set terra-cotta-painted armature that rises from the spare stainless-steel base of a dismantled stool. The armature is plainly an apparatus for display or study, not a figural stand-in. It lifts the thin aluminum panel to eye level, while cutouts in each panel strategically reveal the copper fittings that support the armature’s rods. In sculptures that incorporate actual lengths of cloth, the material appears in tensile guises (this “misuse” of fabric’s native fluidity could be considered the counterpoint to Simpson’s resolute bending of MDF in Court Lady). Cotton webbing striped cream, blue, and red adheres across a sleek frame of copper tubes, like some elegantly pretzeled folding chair (X Bonnet, 1993). Translucent white mesh is stretched over slender rods of aluminum, bracketed at top and bottom by a wooden trunk hanger and crowned by a wooden embroidery hoop (Bib [white], 2006). Simpson’s sculptures do not ask us to imagine ourselves wearing them: A trunk hanger indicates an item in storage; an embroidery hoop indicates an item in process. Questions of studio, archive, and display override the bodily as well. Diane Simpson, Court Lady, 1984, oil stain on MDF, linen canvas, nylon cord, plastic fasteners, 93 1/2 × 38 1/2 × 20". From the series “Historical,” 1984–90. THE MOST SIGNIFICANT point of conceptual coherence across Simpson’s decades of sculpture making is also a point of significant formal coherence. She rarely engages a source whole, instead bearing down on a single detail, producing works that treat the detaila part or featureas a whole in its own right. That detail sometimes connotes the minor, as opposed to the significant, is germane as well. The act of abstracting from a thing-in-the-world is often understood as the act of paring down to a thing’s essence, or of extracting the essence from it. Simpson’s abstraction from her source materials is both a distillation and an elaboration, an opportunity for exaggeration. Cape or shawl, apron or bib, cuff or collarthese are slightly enlarged from their familiar bodily scale, not monumentalized but thoughtfully magnified, dramatized, at times hyperbolized. The vagaries of process and the peculiarities of various non-art materials are central to Simpson’s approach. But whereas the “process art” that emerged in America and Europe during her student years stresses process over and against plan and product, her labor-intensive method ensures that these sculptures arrive at a vital state of finish. Simpson herself once identified post-Minimalist artists Jackie Winsor and Eva Hesse as influences, and the formal taxonomies and jewel-like grotesques of Simpson’s friend the late painter Christina Ramberg feel instructive to identify, too; other writers have connected Simpson’s sculptures to those of Richard Artschwager, Roy Lichtenstein, and Martin Puryear. It seems less productive to dwell on her art-historical idiosyncrasy, however, than to consider the ways in which her individuality operates within her sculptural practice. Uniformities and particularities inform each other, the sculptural effect one of paradoxically intimate remove. But then, in Simpson’s sculptures even the details have details. Specific surfaces might be embossed, shifts in depth might be achieved by complex folding or fluting, corners and edges are granted prominence. So many of her sources are themselves passages of edging, borders or trimthe severe gradient of a ruff, the arc of an eave, how a cuff falls across or stops at the handand she takes up such prompts with great seriousness. The majority of Simpson’s works emerge from formal rather than functional details, and often from ways in which a basic element has already been exaggerated or embellished, as in the elongated sleeves of a Renaissance robe or the unwieldy hips of an eighteenth-century skirt frame. The sculptures currently under way in her studio began from a study of the peplum (a pronounced flare of fabric that accents the waist) and the valance (a dust ruffle that hides the space beneath a bed, or a decorative flounce above a window that masks curtain fittings). Far from denying or defending against the decorative, a quality that abstraction historically disavowed, Simpson mines such figures of excess, in many cases typical to their moment and thus indicative of it. These works make a case for what we might call the internal necessities of detail, exaggeration, and excesseven while “necessity” is a complicated claim to make on their behalf. Occasionally, Simpson chooses to paint parts of a sculpture, or shade with colored pencil, highlighting an armature or distinguishing strips of binding. Numerous moments of decision making materialize from the intuitive mathematics of her axonometric drawings. These choices rarely correlate to source material; rather, the artist is insistent about theirand so about hersubjectivity. She speaks of such matters casually, almost shruggingly, but the sculptures are not casual. In them, sense arises directly from sensibility. Instead of being foreclosed by the prominence of the artist’s so-called subjectivity, Simpson’s sculptures stand as proposals for intersubjectivity. Their contradictionsacute aesthetic individuality and typological abstractiondo not confound one another. They necessitate one another, just as we may need intersubjectivity to establish objectivity in the first place. “Diane Simpson,” curated by Dan Byers, opens at the Institute of Contemporary Art, Boston, on Dec. 16, 2015, and remains on view through Mar. 27, 2016. 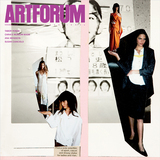 Kate Nesin is associate curator of modern and contemporary art at the Art Institute of Chicago.